The latest reviewed version was checked on 20 May 2018. There are 4 pending changes awaiting review. This module may require a complete rewrite in order to suit its intended audience. You can help rewrite it. Please see the relevant discussion. A box is the TeX term for an invisible container that can hold a visible element, nothing, or other boxes. Glue is the TeX term for an invisible connector that determines the separation between boxes. Each separate visible element contained within a TeX document is contained within a box. A visible element can be a letter, image, geometric shape, etc. TeX builds pages by gluing boxes together according to the default TeX rules, default LaTeX rules, or document commands. In a typical document, letter boxes are glued to other letter boxes to form words, which are then elastically glued to other words to form sentences. Sentences are broken into lines and placed in paragraph boxes. Elastic glue is squeezed or stretched to fully justify lines within paragraph boxes. Paragraph boxes are glued to diagram boxes, and so on. While it is true that boxes can hold other boxes, not all commands that can generate boxes be used within all other commands that can generate boxes. There are often workarounds for these limitations. The size of a box is typically related to the size and position of its contents, but it doesn't have to be. Many box commands accept custom widths and/or heights, and there are other commands that affect the shape and position of boxes. Boxes are placed relative to other boxes, while visible elements are placed relative to the boxes which contain them. A more complete description of boxes and glue can be found in chapters 11 and 12 of Donald E. Knuth's, 'The TeXbook'. A list of basic LaTeX box and glue commands can be found at http://www.personal.ceu.hu/tex/spacebox.htm . The height is the length between the baseline and the top of the box. The depth is the length between the baseline and the bottom of the box. The width is the width of the box. Character boxes are glued together at the baseline. A \parbox is a box of specific width formatted in paragraph mode. In paragraph mode, text is broken into lines and lines are broken into pages. height defines the height of the \parbox. pos selects which baseline to join. It can be top, bottom, or center. This parameter is often confusing to new users! See the special note below. contentpos positions the contents of the box within the box. It can be one of center, top, bottom or spread. Note that contentpos has no effect if the box is not larger than the text it contains. \pbox is available in the pbox package. A \pbox has the same parameters as a \parbox, but if the user provided width parameter is larger than the actual contents of the pbox the pbox shrinks to fit the content. This is only useful if the content contains manual line breaks and you wish to fit the resulting material. The minipage environment takes the same parameters as a \parbox, and behaves nearly identically to it. The difference between a minipage and a \parbox is that you cannot use all commands and environments inside a \parbox, while almost anything is possible in a minipage. The pos alignment parameter does not refer to the \parbox's borders when contentpos is either missing or equal to pos and anytime pos= center! 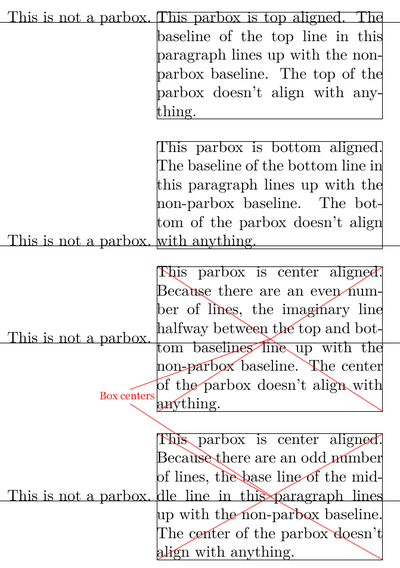 Under any of these circumstances the alignment parameter selects which line of text within the \parbox will be used to align the paragraph box. The \parbox is placed so the baseline of that chosen line of text is aligned to the baseline of the box that the \parbox is glued to. Thus, if the pos is set top, the baseline of the top line of text in the \parbox will line up with the baseline outside of the \parbox. In the special case of a parbox that has only one line of text, that one and only line of text is the top, bottom, and center line of text simultaneously, and changing pos will appear to do nothing unless additional text is added. If the contentpos is present and not the same as pos and pos is not center, the \parbox will align at its borders. Makebox creates a single-line box, optionally of fixed width, but otherwise large enough to hold its contents. Note that the width does not have be wider than the contents: for instance, setting width to 0 typesets the content without changing the current position. (E.g., this would allow for an overstrike.) Makebox is typically used to prevent hyphenation (see Hyphenation) or simply to keep text that belongs together from being placed on separate lines. You cannot place line breaks (\\) within a Makebox. mbox is the shorthand no-option version of Makebox. The pos parameter takes a one letter value: center, flushleft, flushright, or spread the text to fill the box. The command \framebox behaves identically to \makebox except that it additionally draws a box around its contents. You can tweak the following frame lengths. \fboxsep: the distance between the frame and the content. \fboxrule: the thickness of the rule. This shows the box frame of a letter. This is an easy way to box text within a document! A savebox is a non-rendered box that is saved for later repeated rendering via the usebox command. The command \newsavebox creates a placeholder for storing content; the command \savebox stores the specified content in the placeholder without rendering it in the document; and \usebox renders the content of the placeholder into the document. See Colors. \fcolorbox can also be tweaked with \fboxsep and \fboxrule. The fancybox package provides additional boxes. command lets you define the vertical properties of a box. You can use \width, \height, \depth and \totalheight in the first three parameters, in order to act upon the size of the box inside the text argument. The two optional parameters set for the height and depth of the raisebox. For instance you can observe the difference when embedded in a framebox. terrible had happened to him. The graphicx package features additional boxes. This page was last edited on 27 March 2019, at 11:12.